BUFFALO, NY — Nineteen different Division I hockey-playing schools can celebrate players honored as CCM/AHCA Hockey All-Americans for the 2018-19 season. The nation's top 25 college hockey players were announced tonight at the NCAA Men's Division I Frozen Four in Buffalo. St. Cloud State led the way with four honorees, followed by two selections each from UMass, Minnesota Duluth and Northeastern. - Six players had been recognized as All-Americans previously. - There are 20 players from 12 different U.S. states, 4 Canadian players from three provinces and one player from Germany. - The source of the most players: six from Minnesota. - The junior class dominates: no freshmen, 6 sophomores, 13 juniors and six seniors. 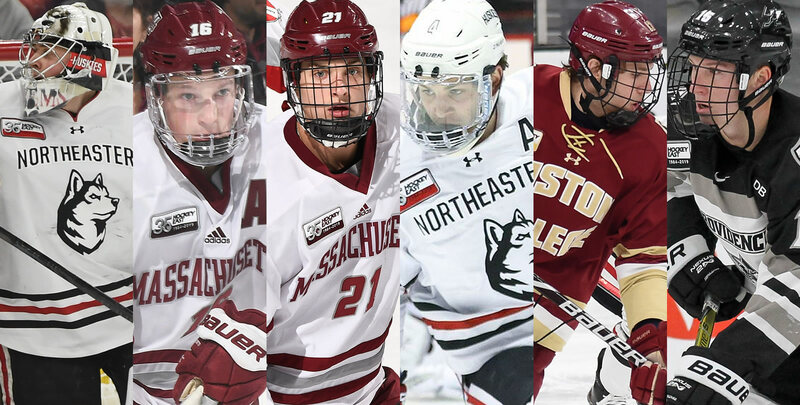 - The conference breakdown: six each from Hockey East and the NCHC, five from the Big Ten, four from ECAC Hockey, two from Atlantic Hockey and one each from the WCHA and independent Arizona State, the first ever from ASU. - 18 players participated in the NCAA Tournament. Five of them advanced to the NCAA Frozen Four in Buffalo, NY.. The CCM HOCKEY ALL-AMERICAN ICE HOCKEY TEAMS are sponsored by CCM HOCKEY and chosen by members of the AMERICAN HOCKEY COACHES ASSOCIATION. CCM is the legendary hockey brand dedicated to the endless pursuit of performance by delivering game-changing, head-to-toe innovative hockey equipment to players worldwide.